Epsom Salt is chemically known as magnesium sulfate. 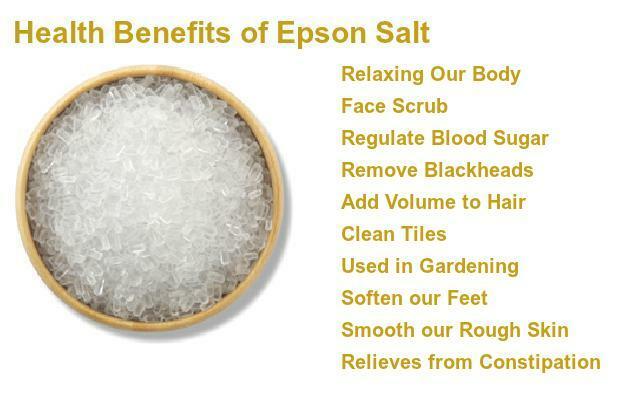 There are many beneficial properties of Epsom salt and it is used in gardening, household cleaning etc. The minerals magnesium and sulfate present in it provides powerful health benefits which can enhance the detoxification capabilities of our body. Let’s see some of the useful health benefits of Epsom Salt. Dissolve Epsom Salt in warm water (filtered water not tapped water which contains fluorine, chlorine, heavy metals) and take a bath from it.This relieves stress by promoting the production of serotonin and reducing the effects of adrenaline. Mix 1/2 – 1 teaspoon of Epsom salt in the cleaning cream and apply the mixture on the skin in the circular motion and then rinse them. This helps in removing the dead skin cells. Health Benefits of Epsom Salt: Mix 1 teaspoon of Epsom salt with 4 drops of iodine with the half cup of hot water. Stir the mixture till salt gets dissolved and water gets luke-warm (not hot). Then apply the mixture to the skin having blackheads after getting it dry wash the face with hot water and then pat dry with clean cloth. Add equal parts of Epsom salt to equal parts of our conditioner, apply the mixture on hair for 15-20 minutes and then rinse with water. It helps to remove excess oil from hair and make our hair greasy. Mix equal parts Epsom salts with liquid dish detergent and apply this mixture to dirty or stained surfaces in the bathroom, kitchen, or even outside and allow it to soak in for a minute or two. Then scrub away the loosened grime and rinse clean. 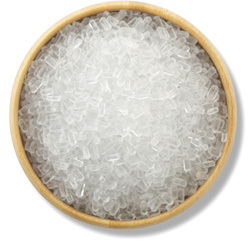 Magnesium sulfate present in Epsom salt can be used to fertilize our plants and also remove unwanted insect pests. Take half cup of Epsom salt into a tub of warm water and soak feet for 10 – 15 minutes. It makes our skin soft. Take 1- 2 tablespoons of Epsom salt with body wash and massage the mixture over any rough patches, such as elbows, knees, and feet, for smoother skin. Dissolve two tablespoons of Epsom salts into a cup of warm water and drink. It can relieve constipation. Health Benefits of Epsom Salt: Absorb the Epsom salt through the skin via bath this helps in relieving muscle tension, pain, and inflammation in joints. Health Benefits of Epsom Salt: To get relief from an itchy bug bite, stir 1-2 tablespoons of Epsom salt into 1 cup of water, dip a cotton washcloth in the mixture, and apply directly to the bite for relief.